A quality 100% horsehair shoe shine brush with dark or light colored bristles. A perfect fit for most hands. 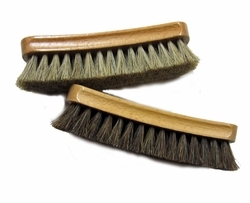 The horsehair brush distributes the polish evenly over the shoe and takes off any excess polish. It also helps the polish to get into the pores of the leather and penetrate the area between the upper and the sole. That is important to help protect the shoes from the elements. After you have used the brush you can give it a final polish with a shine cloth. The purpose of having the two different color brushes is that once you get the black shoe polish on a brush you should use it for black shoes only. If you use that brush on a lighter pair of shoes that black polish will always darken them. We do offer a larger brush if that works better for you if you have a large hand or if you work with a lot of boots but this size brush is the most common and comfortable for most people.